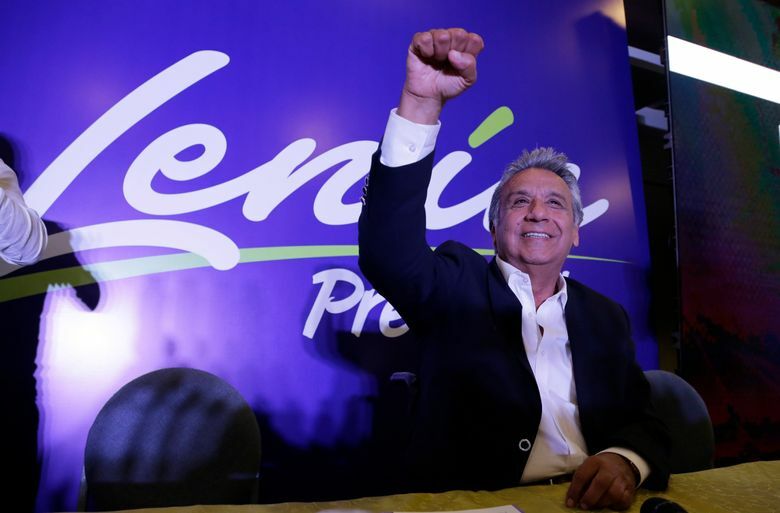 QUITO, Ecuador (AP) — Ecuador’s nail-biter election is heading to a runoff after results showed ruling party candidate Lenin Moreno falling just shy of the votes needed to clench a first-round victory, officials said Tuesday. With nearly 95 percent of all votes officially tallied, the current results are “irreversible,” said Juan Pablo Pozo Bahamonde, president of the National Electoral Council. 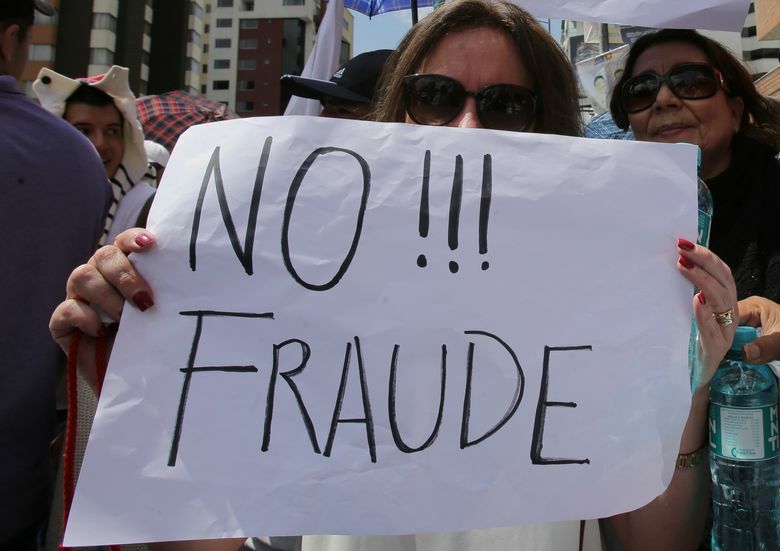 The results end two days of suspense as supporters of opposition candidate Guillermo Lasso took to the streets to protest what they said was an attempt at fraud to favor Moreno, President Rafael Correa’s hand-picked successor. 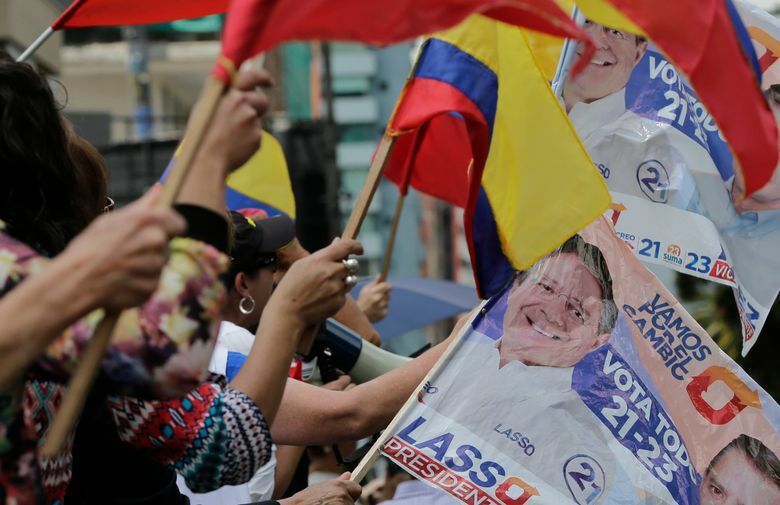 The small Andean country will now hold a second-round of voting on April 2, an election that will remain closely watched in Latin America as Moreno faces off against Lasso, a conservative former banker. The region has shifted right over the last 18 months, as conservative leaders in Argentina, Brazil and Peru have assumed power after the end of a commodities boom that boosted leftists like Correa. Several losing candidates who shared Lasso’s conservative agenda and fatigue with Correa’s iron-fisted rule have already thrown their support behind Lasso for the second round, including former congresswoman Cynthia Viteri, who finished third with more than 16 percent. Former Quito Mayor Paco Moncayo, the only leftist among the seven trailing candidates, said he wouldn’t ask the 7 percent of voters who backed him to vote for either candidate in the runoff. “Most opposition voters will probably end up supporting Lasso in a head to head contest focused on change versus continuity,” the Eurasia Group, a political risk consultancy, wrote in an analysis. The analysts speculated that the delay in announcing the vote result would help unify opposition support for Lasso. The slow result announcement was the first time in recent memory that Ecuadorean authorities had not declared a winner on election night. 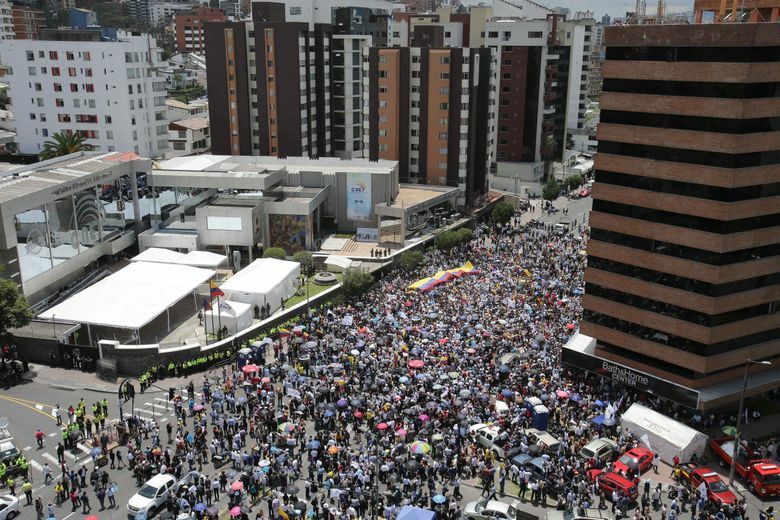 Lasso’s supporters gathered in the streets in front of the National Electoral Council overnight Sunday and Monday to demand that a runoff be confirmed. Rumors swirled on social media as the vote results trickled into a third day Wednesday. A group of people broke down a door at a building in Quito where ballots were supposedly being burned. Outside an electoral office in Guayaquil, police erected barricades to keep supporters and opponents of Correa apart. The Defense Ministry issued a statement denying reports that some sort of military uprising was underway. “Ecuadorean people: You have won. We’re going to defend this victory,” Lasso told supporters in a video message in which he urged protesters to stay mobilized. He said he had called several regional presidents and the head of the Organization of American States to express his concern. Electoral authorities appealed for calm, saying it could take until Wednesday to know if a runoff would be necessary. They said the delay was due to the slow arrival of ballots cast in remote rural regions and consulates abroad as well as inconsistencies on tally sheets that needed to be sorted through. In a press conference Tuesday, Moreno said that he was prepared to go into a second-round if needed and believed he would solidly defeat Lasso. “Our message is one of peace, justice and respect for institutions,” he wrote on Twitter after the results were announced. 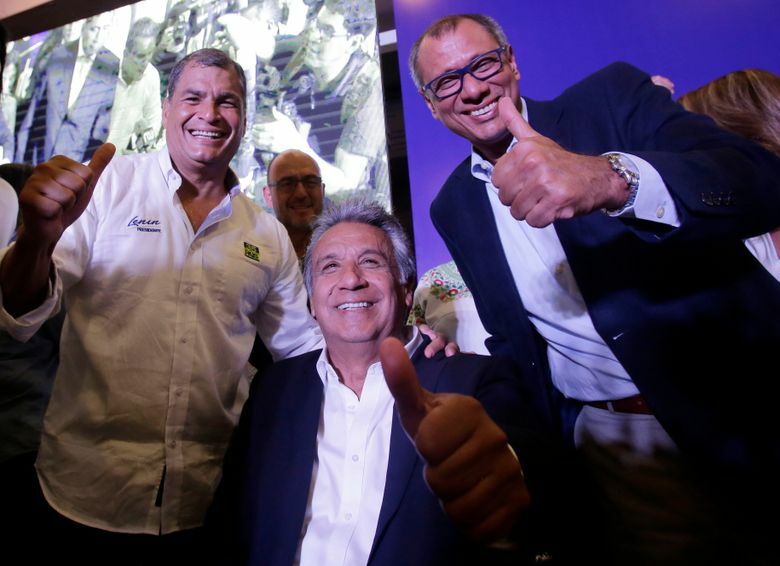 A self-declared “21st century socialist,” Correa was elected president in 2007 and he won praise for ushering in stability for Ecuador after a severe economic crisis that saw three presidents toppled by street protests and the adoption of the U.S. dollar to control rampant inflation. But Correa also drew criticism for his iron-fisted approach against much of the press, opposition and judiciary. The sheen on his administration also has been tarnished as once-flush government budgets were cut and thousands of employees at state-run companies laid off amid a decline in oil revenues for the OPEC nation. The International Monetary Fund has forecast Ecuador’s economy to shrink 2.7 percent this year and many analysts predict that Correa’s successor will have to seek a bailout from the multilateral lender.